You are here: HomenextNew contributionsnextBasildon Drive 1945. Sue Fawcett, recently found this old photo amongst her mother’s possessions. 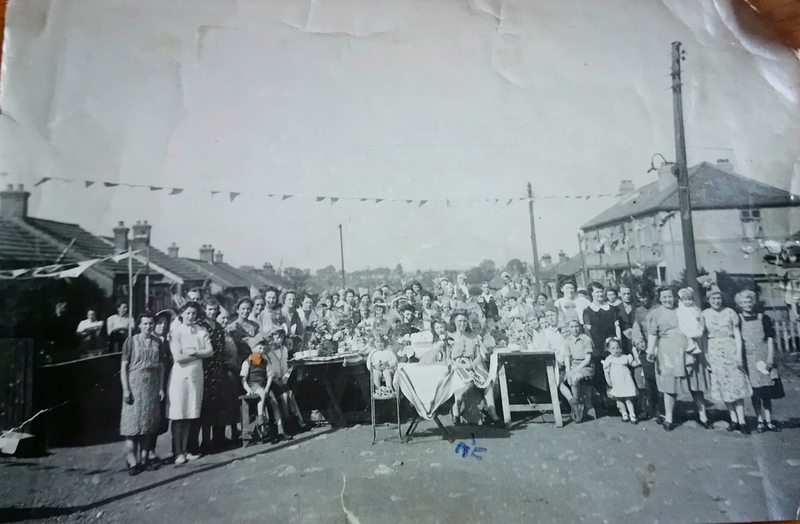 It shows the 1945 VE Day street party in Basildon Drive, Laindon. Sue’s mother (Lilian Bateman) lived at No. 51 during the war. (She had marked herself sitting in the front). Lilian married Henry Harsent. The couple lived in Ashleaves Avenue, Roberts Road and then moved to No. 57 Basildon Drive. Sue has kindly given her permission for the photo to be published on the website and hopes others will enjoy seeing it. I recognised the area straight away, the two storey houses on the right and the bungalows on the left, some of which are still there. Like many roads in Laindon, Basildon Drive was originally unmade. I lived in one of the central houses for 20 years 1955-75, two of my brothers were there. It was a block of four properties located between Dicken’s Drive and Kathleen Ferrier Crescent. The bungalows opposite are still there, but the houses were knocked down to allow for the Copperfields development.